Man Jumped From an Altitude of 102,800 Feet Back to Earth-Truth! - Truth or Fiction? 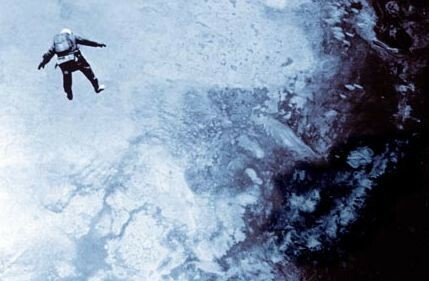 Man Jumped From an Altitude of 102,800 Feet Back to Earth-Truth! This is a forwarded email with the story of U.S. Air Force Captain Joe Kittenger’s amazing free fall jump from close to 20 miles above the Earth. The email alleges that Kittenger floated to outer space in a specially equipped balloon and jumped from a height of 102,800 feet with nothing more than a special pressurized suit and a parachute. 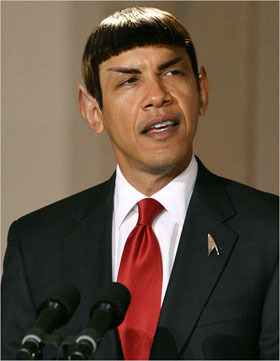 The story is true and is posted on an official U.S. Air Force web page on the Internet. On August 16, 1960 Captain Joe Kittenger became the first man to freefall back to earth from an altitude of close to 20 miles. 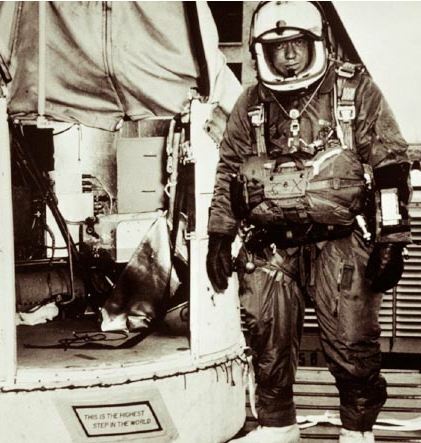 The environment was so harmful at 102,800 feet that Kittenger had to wear a pressurized suit with layers of insulation to keep him alive in temperatures as low as -94°F in the vacuum of space. At any elevation above 62,000 feet a man’s blood would literally boil because of the extremely low atmospheric pressure. Kittenger’s freefall descent lasted about 4 minutes and he reached a speed in excess of 600 miles an hour, faster than the speed of sound. At 18,000 feet he deployed his parachute and landed safely in the New Mexico desert. The total time of his voyage back to Earth was 13 minutes, 45 seconds. Kittenger continued his military career commanding the 555 Tactical Fighter Squadron and flying an F-4 Phantom Jet during the Viet Nam war. Shortly after shooting down an enemy MiG-21 aircraft Kittenger was shot down and captured on May 11, 1972. He was held at the “Hanoi Hilton” as a prisoner of war for 11 months. Kittenger retired from the Air Force at the rank of Colonel in 1978 and today still enjoys flying. After free-falling for more than four and a half minutes, slowed finally by friction from the heavier air below, he felt his parachute open at 14,000 feet, and he coasted gently down to the New Mexico desert floor. 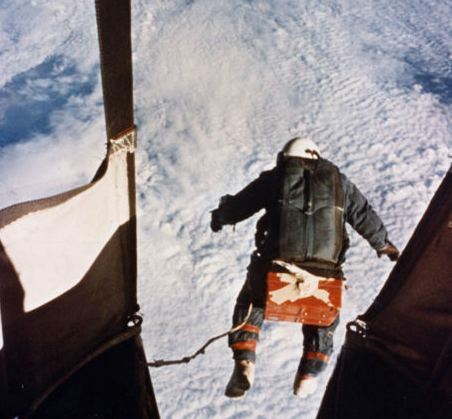 Kittinger’s feat showed scientists that astronauts could survive the harshness of space with just a pressure suit and that man could eject from aircraft at extreme altitudes and survive. Upon Kittinger’s return to base, a congratulatory telegram was waiting from the Mercury seven astronauts–including Alan Shepard and John Glenn. 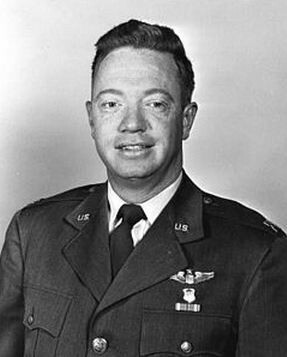 More than four decades later Kittinger’s two world records–the highest parachute jump, and the only man to break the sound barrier without an aircraft and live–still stand. We decided to visit the retired colonel and Aviation Hall of Famer, now 75, at his home in Altamonte Springs, Florida, to recall his historic jump. Joe Kittinger: We got up at 2 a. m. to start filling the helium balloon. At sea level, it was 35 to 40 feet wide and 200 feet high; at altitude, due to the low air pressure, it expanded to 25 stories in width, and still was 20 stories high! At 4 a. m. I began breathing pure oxygen for two hours. That’s how long it takes to remove all the nitrogen from your blood so you don’t get the bends going so high so fast. Then it was a lengthy dress procedure layering warm clothing under my pressure suit. They kept me in air-conditioning until it was time to launch because we were in the desert and I wasn’t supposed to sweat. If I did, my clothes would freeze on the way up. It took an hour and a half to get to altitude. It was cold. At 40,000 feet, the glove on my right hand hadn’t inflated. I knew that if I radioed my doctor, he would abort the flight. If that happened, I knew I might never get another chance because there were lots of people who didn’t want this test to happen. I took a calculated risk, that I might lose use of my right hand. It quickly swelled up, and I did lose use for the duration of the flight. But the rest of the pressure suit worked. When I reached 102,800 feet, maximum altitude, I wasn’t quite over the target. So I drifted for 11 minutes. The winds were out of the east. What’s it look like from so high up? You can see about 400 miles in every direction. The formula is 1.25 x the sq. root of the altitude in thousands of feet. (The square root of 102,000 ft is 319 X 1.25 = 399 miles) The most fascinating thing is that it’s just black overhead–the transition from normal blue to black is very stark. You can’t see stars because there’s a lot of glare from the sun, so your pupils are too small. I was struck with the beauty of it. But I was also struck by how hostile it is: more than 100 degrees below zero, no air. If my protection suit failed, I would be dead in a few seconds. Blood actually boils above 62, 000 feet. I went through my 46-step checklist, disconnected from the balloonšs power supply and lost all communication with the ground. I was totally under power from the kit on my back. When everything was done, I stood up, turned around to the door, took one final look out and said a silent prayer: “Lord, take care of me now.” Then I just jumped over the side. It’s the beginning of a test. I had gone through simulations many times–more than 100. I rolled over and looked up, and there was the balloon just roaring into space. I realized that the balloon wasn’t roaring into space; I was going down at a fantastic rate! At about 90,000 feet, I reached 714mph. It hurt–there was quite a bit of swelling and the blood pressure in my arm was high. But that went away in a few days, and I regained full use of my hand. What about attempts to break your record? We did it for air crews and astronauts–for the learning, not to set a record. F-35 Airplane Takes Off Vertically, Flips-Fiction! Michelle Obama Waved Flags of Communist China-Fiction!